mmm! i love this one! i also leave out the margarine, and if i use vanilla soy, i leave out the vanilla. any sweetener works too. i've used evaporated cane juice and honey. if you do use honey, use only 1/2 to 2/3 the amount. I used sucanat in mine, and it was great. We replaced the sugar with 1/4 cup of sucanut and 1/8 tsp stevia. And it ROCKS! Stevia is better for you, just in case you didn't know. ok Vic, with knowledge like that you should be a contributor. Tell Tine to send you an invite link. 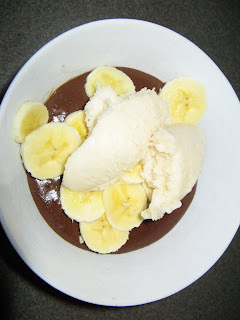 we just had leftover carob pudding for lunch. it was delicious. thanks to mom's suggestion, i now make it in my vita-mix. blend it for several minutes (mom says 7). it's warm and thickening. then just poor it into a saucepan over medium heat and thicken the rest of the way. it's not faster, but you don't have to stand and stir the whole time. 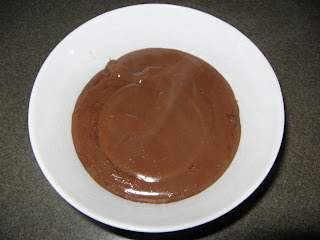 also, it makes it more like mousse than pudding, cause it whips air into it. i really like it that way. and one more thing . . . i only use 1/3 cup evaporated can juice, and it's plenty sweet.